"…Math, science, history, unraveling the mystery that all started with a big bang". Season 7 of "The Big Bang Theory" is headed to Blu-ray and DVD and is a must have item for fans of the show. Leonard (Johnny Galecki), Sheldon (Jim Parsons), Penny (Kaley Cuoco-Sweeting) and the rest of the gang are back and once again taking us through 24 episodes of Science and Technology via a nerdy and hilarious ride while managing to touch out hearts and throwing a few "life lessons" in along the way. Of course one of the main foci of the show is the established relationships of this group of friends and colleagues and this season moves them along at a nice pace. Penny and Leonard are still a couple dealing with Penny's life "crisis" as she faces the harsh reality of her non-existent acting career which ultimately leads them down a road culminating in their long awaited engagement. Raj (Kunal Nayyar) finally gets himself a girlfriend and Amy (Mayim Bialik) and Sheldon kiss on the lips in a very special Valentine 's Day episode. One of my favorite episodes is "The Thanksgiving Decoupling" where Penny and Leonard's relationship is once again tested when it is discovered Penny is actually married to her ex-boyfriend via a cheesy Las Vegas wedding she thought was fake and where Sheldon bonds with Bernadette's (Melissa Rauch) father and ends up drunk and much more uninhibited than his normally tightly wound self. I also enjoyed, "The Scavenger Vortex", an episode in which Raj creates a scavenger hunt and breaks the group up in to pairs to compete. It was interesting to see how the characters related to each other when the rest of the group wasn't around. The most fun of the "couplings" was Amy and Howard (Simon Helberg) who spent most of the episode Karaoke style when they discovered a mutual love of Neil Diamond. Especially noteworthy was "The Proton Transmogrification" episode where the guys prepare for Star Wars Day. While there are still many laughs, this episode is a little somber as Sheldon deals with the death of one of his childhood idol, "Professor Proton". As an added bonus, the DVD extras include a segment called The Big Bang Theory's May the 4th, documenting the relationship between the show and Industrial Light Magic (ILM) and how they worked together to create this very special episode. It was interesting to see the ILM technicians employ some of the same type of technologies to recreate the ghostly shadow of Professor Proton that was used in the original "Star Wars" to create Obi Wan Kenobi's Ghost. This season also has some great special guests starts including Christine Baranski as Leonard's mom, Laurie Metcalf as Sheldon's Mom, James Earl Jones as himself and Bob Newhart as Professor Proton. The DVD extras are worth watching and one segment even focuses on James Earl Jones while another, "The Big Cendrowski: Backstage with the Coolest Director and Cast in the Universe", gives some insight into a typical day on the set through the Director's eyes. Of Course the Blu-ray is 1080p High Def which makes the picture so crisp and the audio is DTS-HD Master Audio 5.1 ensuring every laugh is loud and clear. 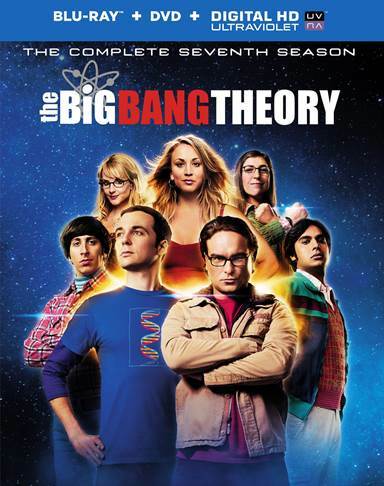 Download The Big Bang Theory: The Complete Seventh Season from the iTunes Store in Digial HD.